When Frankie Morrison was born, doctors told her parents, Maria and Chris, that there was a priest in the room next door. No one thought that the little girl would survive. It all started when Maria noticed that Frankie wasn’t moving in her uterus any longer. The worried mother went to the emergency room, but doctors dismissed her saying that the child was probably just “a little lazy.” They sent Maria home, but she still felt that something was wrong. Maria returned to the hospital two days later, and doctors found out that although the baby wasn’t moving, she still had a heartbeat. 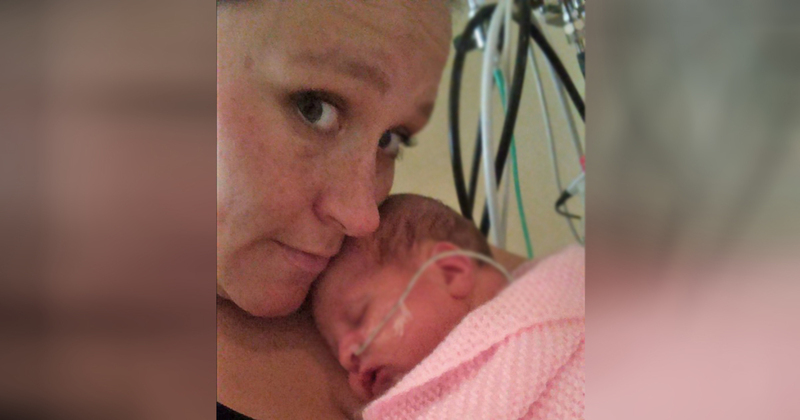 Doctors performed an emergency cesarean, but Frankie was unresponsive when she came out. The outlook looked grim and doctors brought the newborn baby girl into another room. Frankie was born with only two tablespoons of blood in her entire body—everything else was water. This is only 15 percent of the blood that an average newborn would have. “When I came around from the operation I could see people standing around me crying. I went up to her and there was this chubby little eight pound baby who was so bloated because she had all this water instead of blood inside her,” Maria told the Daily Mail. Infants get blood through the umbilical cord, but in this case, that didn’t happen. And even after two successful blood transfusions, doctors were still unsure if Frankie would survive. Please watch the video below to see how Frankie’s parents’ worst nightmare turned into a story of hope, love, and happiness. Share Frankie’s story if you’d like to wish this lovely family and their miracle baby good luck in the future!